If there is one overarching theme for my 2016 posts, it can be expressed with one word: “late”. No matter how useful my advice will be, the major present-buying holiday takes place in mere two days, so yes, it is truly late. But – the comforting thought is: if you got a wine lover, an oenophile in your life, wine is always, always an excellent present. Or anything related to the wine for that matter. Except for the 5th identical book – oh well, nothing wrong with re-gifting, right? Now, when it comes to the presents for the wine lovers, I already covered the subject quite extensively over the past few years. I checked what I wrote before, and was happy to realize that all or practically all of my advice still stands – thus, allow me to simply give you a reference to the older posts – if you are still looking for the present, you might find my suggestions helpful. Part 1 – Wine gifts – this post provides a general introduction for “practical and pragmatic”, and it is talking about various wine gifting options. Part 2 – Wine Accessories – openers, pourers, decanters and lots more – what makes sense, what doesn’t. Part 3 – Wine Education – books, classes, experiences – everything the wine lover might really appreciate. Here is also a post on the same subject from 2011 – while it will not give you much new information conceptually, it has more recommendations as to where to buy the wine. Before we part I want to mention that I created now a collection of useful wine gift items on Amazon. All the books there are personal recommendations and all the accessories are split into different categories to simplify navigation. That’s all I have for you, my friends. Better late than never, eh? Happy Holidays and happy last minute gift hunting! Cheers! Did the Wine Santa Delivered? Mine did! Hey secret Wine Santas and their equally secret gift recipients, are you there? I know that the secret Wine Santa mission was once again orchestrated by The Drunken Cyclist (here is the secret post about it). If you are not familiar with the “Secret Wine Santa” operation, it works as any secret Santa game often played in the offices, only better, because there is no chance of getting wine themed underwear, you can only get wine. All the participants provide their addresses to the Secret Wine Santa headquarters, i.e. Jeff aka The Drunken Cyclist, who then magically assigns the Santas with their respective recipients, and voila – the wine magically appears at your door step, sent directly from the North Pole and delivered by the reindeer, or something like that. Anyway, you got the idea. I put on my Santa’s hat and send two bottles of wine – 2007 Krupp Brothers Black Bart Marsanne Napa Valley and 2011 Michel Chapoutier Tournon Mathilda Shiraz Victoria, Australia. I can tell you that my work was only 50% successful – my recipient, who will remain secret, doesn’t like white wines with the oak on them, so Marsanne didn’t really work. However, for all I understand, Mathilda Shiraz became a nice surprise, as it was for me, with its pronounced peppery qualities. All in all, I think I did okay as a Secret wine Santa, but there is definitely a room for improvement. 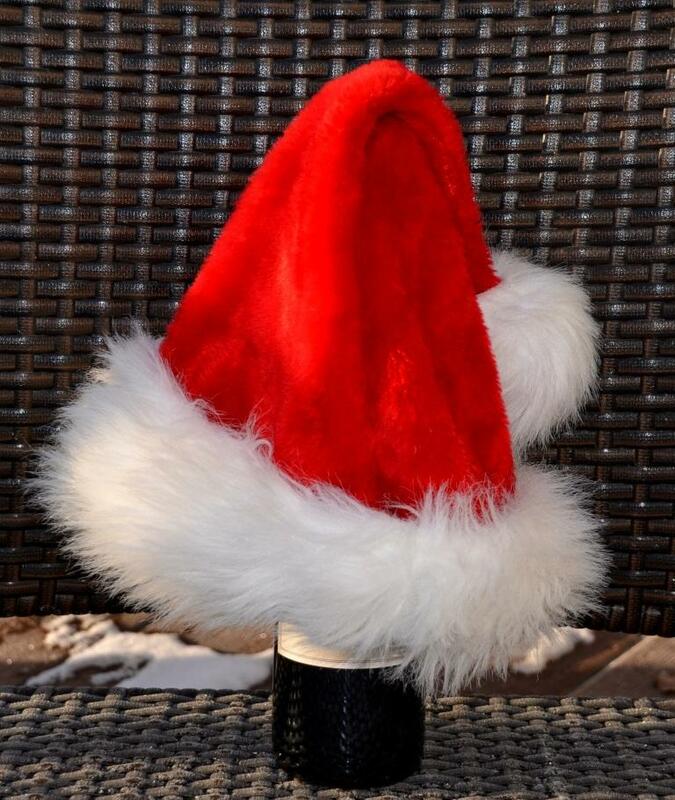 The best part of the Wine Santa game is that it is a two way street – you send wine, but you also receive wine! I don’t know if this was an accident or a deliberate decision, but my “secret” Santa was Chef Mimi – who was my wine recipient last year. 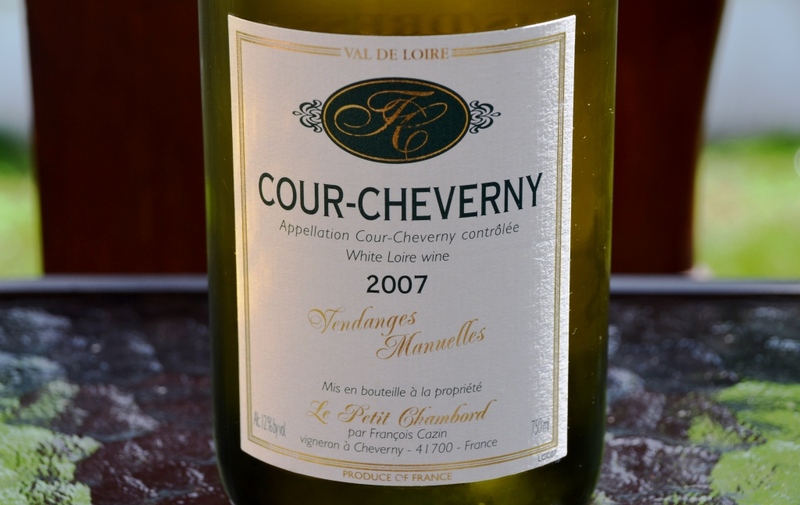 The wine, which arrived a while back, was accompanied by a very nice letter, explaining why Chef Mimi have chosen this wine for me – it is one of her favorite wines. The letter also gave me the story of the people who make this wine, who are Chef Mimi’s neighbors. It took me a while to find a good moment to open the wine, and finally I did. I used my trusted VersoVino to help the wine to breathe a little faster, but with or without it, what a treat it was! Erba Vineyards is located in the Napa Valley at a high elevation site (1100 – 1500 feet above sea level) near Atlas Mountain. 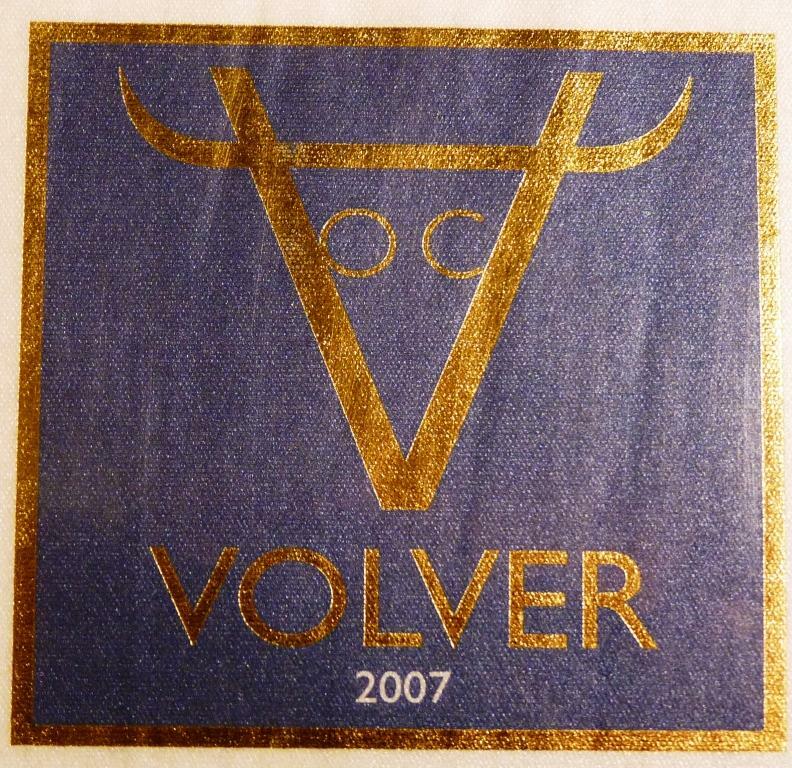 The vineyard was planted in 1998 with 5 of the Bordeaux varietals (Cabernet Sauvignon, Merlot, Cabernet Franc, Malbec and Petit Verdot) and Syrah, with majority of plantings (70%) been Cabernet Sauvignon. 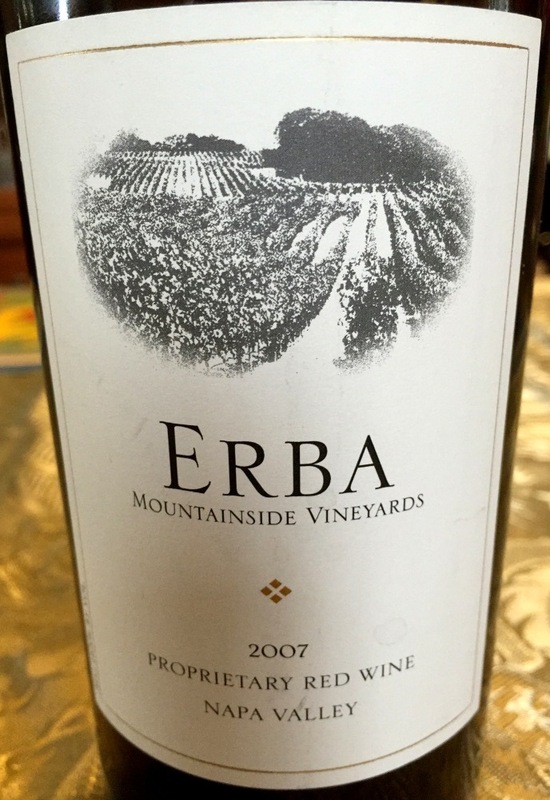 First commercial release of Erba Vineyards wines was in 2003. There you have it my friends. If you had been on the either side of our wine Santa game, I hope to read about your experience. And if you had not, I hope you will join us next year, it is fun! It is so much fun that I’m even thinking we should have a summer mid-year rehearsal. Thank you very much Secret Santa Chef Mimi for the delicious wine! And to all of you who celebrates, Merry Christmas! Cheers! And we are on the finishing stretch! Third and the last installment of the Wine Gifts Guide. We already talked about wines and wine gadgets as two large gift categories. This post will be a bit different from the previous two. If I pressed and pressed the need to be practical and pragmatic when it comes to the wine and wine gadgets, it will be hardly applicable to this last group of potential wine gift recommendations. You will easily see why it is so, and without further ado, let’s get to it. Wine Books. Yes, wine lovers still read books. If anything, we use books as a reference. There are plenty wonderful wine books which will make any aficionado happy – the famous World Atlas of Wine, Wine Grapes Guide, Jura Wine, Food and Travel, and hundreds and hundreds of others. It is hard to go wrong with the book – the only issue might be if the recipient already has the exact same book, so I guess our principle of “practical”, knowing what the other person has, would still come handy. Nevertheless, the wine book would make a great present for the most of the wine lovers. Wine Education. Wine education is fun, it is almost priceless for the wine aficionado. You can never know it all, and even if you think you do, you will still learn a lot, given the opportunity. There are many wine classes and wine schools offered around the country and I’m sure, the world. Yes, you will need to spend some time to find the reputable wine school and wine educators. But the gift recipient will really appreciate it. For instance, a famous Windows on the World Wine School taught by Kevin Zraly – you can buy a gift certificate for a single class at $125, and the series of the 8 classes would cost $995. Yes, it is a lot of money, but hey, my job is to give you ideas, it is your job to get from the dreams to the reality. Grand Wine Tastings. A ticket to the Boston Wine Festival Gala Dinner will cost about $250 per person. Wine Spectator Grand Tour is $225 per person. You will create memories forever by sending special people in your life to such an event. Wine Master Classes/Dinners/Vertical tasting. If you can score tickets to the event of this kind, they will run about $450 – $600 per person – but hey, I’m sure you have people in your life who are well worth it. Again, guaranteed memories for life. Wine Travel. Send your grown up kids on the 10 days wine tour in Tuscany – I guarantee you will change their life forever. Or – grown up kids, remember how much your parents did for you? Send your parents on the trip of the lifetime while they can still enjoy it! Remember, the best things in life are not things. Collect the experiences and help others do the same. Wine Art. Similar to the books, I’m sure most of the wine lovers will be happy to get a beautiful painting. Yes, there are lots of options, in all different price ranges. If you live in the US, you can find very nice paintings in your local Home Goods store, where it will cost you $25 – $50. Yes, it will be mass produced art, but I personally own a few of those, and they make me happy when I look at them. But you don’t have to be confined to the home decoration store selection – you can look for the actual artists who creates paintings and other forms of art, all wine related. Here are two references for you – Leanne Laine categorizes herself as “The Women in Wine Artist” – she has a lot of beautiful wine-themed paintings which are available from her website. Another artist I know of, Ryan Sorrell, creates beautiful mosaics from the wine bottle foil tops – here is the link to Ryan’s website. These are just two artists I know of, but I’m sure you will find more artists – and again, I think wine art is a great gift category on par with all others. Well, believe it or not, but we are done! I don’t have any more wine gift recommendations for you, and this series is over. I only hope that I was able to give you at least a tiny amount of useful information, and if you got a wine lover in your life, your shopping task will be a little bit simpler. If you will find this information useful (and especially if you will not), I would love to hear from you. 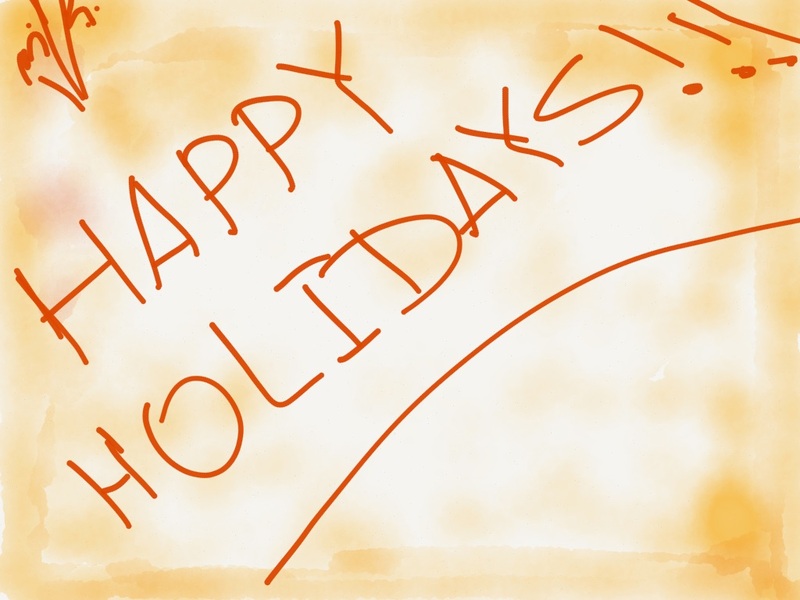 Happy Holidays and Cheers! Here we go again – as promised, a continuation of our Wine Gift Guide (here is the link for the first part, where we were talking specifically about wine as a gift). Please remember our guiding principals – practical and pragmatic. Know what your gift recipient needs or wants. Measure it up for yourself – would you be happy getting the same exact gift. Spend the money as you would for yourself, not as you would think you have to spend to look good. The theme of today’s installment of the Wine Gifts Guide is Wine Gadgets, often also called Wine Accessories. This category includes everything which helps you to handle the wine or the bottle, and the whole idea behind gadgets is that they help to enhance the pleasure of drinking wine. An elegant glass, a beautiful decanter, an easy to use wine opener, a pourer which protects the bottle’s label, your hands, and white tablecloth – all are the tools helping you to enjoy wine to its fullest. The subject of gadgets is much bigger than the wine itself – there are myriads of them. Remember, you are presenting the gift to the person you care about. Know what the person needs, or even more importantly, what the person already has. As it was mentioned in the previous installment, getting the second bottle of your favorite wine is never a problem. Getting 3rd set of glasses the recipient has no room for, which will end up in the basement and will never be used, is not what you want, period. Think before you buy. On the positive side, many wine accessories are often small and inexpensive, so they make ideal “stocking stuffers” or can be easily combined for a bigger gift. 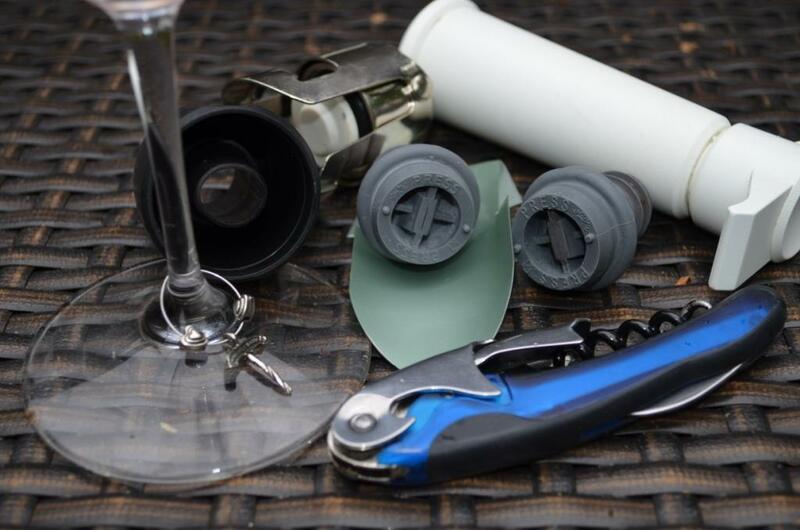 Last note before we talk about particular gadgets – I wrote about some of the wine gadgets before (wanted to create a whole series, but that didn’t work), so here is the link where you will find detailed references to the accessories I will mention below. Let’s go. Wine Glasses. Often an excellent gift, best if you know that the other person needs them – wine glasses are bulky and require dedicated storage space. There are multitudes of glasses available. Yes, you can go to the extreme of varietal-specific top notch glasses from Riedel, which will set you back about $50 a piece. You can also get a universal Riedel tasting glass at around 1/4th of that, or you can get 5 Zwiesel glasses for the same amount. You don’t have to get Riedel varietal glasses – 95+% of the people (I’m generous here) will not notice the difference – but of course do what you think is right. And measure it up for yourself. Example – I don’t like Riedel O stemless glasses – therefore, I will never give them to someone as a present. Okay, I think we are clear on this subject. Wine Decanters. I love decanters, I own 3 of them. In some cases, you simply need them (think Barolo). Even if you don’t really need the decanter, it typically adds to the pleasure of wine consumption. Don’t buy decanter by the price – if it looks good for you, get it. Nobody will feel the difference in the wine decanted in the $30 and $130 decanters. Wine Pourers. I personally love those – they greatly contribute to the enjoyment of wine by preventing the spills, red circles on the tablecloth and red fingers. They are also small, so it shouldn’t be a problem for anyone. Some pourers also serve as aerators, so you get the double bonus. Wine Preservers. I love my Vacuvin, and I use it daily. But – you really need only one, as they are extremely durable. Then again, maybe you want to give your dear friend a Coravin ($250) – it is your choice. Generally, wine preservation solutions are good to have, so go for it. Wine Stoppers. If you find something super-cool – go for it. But remember that average wine aficionado has about 10 or 15 of those already stuffed in all the corners of the cabinets. Unless yours is amazing, there is a good chance that it will end up last in line – and nobody needs to use 16 bottle stoppers at once. Wine Chillers. Some look nice (like the frozen sleeve ones) and they actually work. A lot of wine chillers don’t work. I don’t like the icicles, and any electronic chiller is an absolute waste of money and storage space (I have mine stuffed in the corner of the closet – used it once – if you need it, I will ship it to you). Remember that bucket of ice with water will get any wine to the proper drinking temperature in 25 minutes tops – and it doesn’t take any space until you actually have to use it. Wine Charms. These are typically the least offending – they are tiny, can be stored easily anywhere, and kind of fun at the parties. Wine carriers. I like this category. They often come handy when traveling with wine, so yes, this gets my vote. Make sure they are actually sized right and can accommodate bottles of different sizes – I have one which will not take a burgundy shaped bottle no matter what, so make sure to check the one you are planning to get. Wine Luggage. It is generally expensive and would make a great gift – only if you know that the other person actually wants it. Taking a specific piece of luggage to travel with wine requires determination – find out before you will spend money on something which will never be used. Wine storage solutions. This is a broad and generally useful category – if the other person wants it and needs it. Wine storage solutions are usually bulky – know that the person will be able to fit that 36-bottle wine rack or a wine fridge. This type of present usually requires full coordination on both sides. In this category, avoid tiny wine fridges (6 bottles or less) – they take space, and their utility value is non-existent. As soon as you will store 6 bottles, you will end up with additional 24 requiring storage. It’s a rule, remember it. Eclectic gifts, or gifts for geeks. Okay, you will be surprised how many accessories can fit into this category. Port Tongues. Porrón. Wine Thermometer. There is no limit to the unusual gifts – and they are generally fine, but you better know your gift recipient. The person who drinks Chardonnay with the cube of ice might not really appreciate the concept of Porrón, so be discerning if you are looking into this category. What no to get. Anything which promises to manipulate the taste of wine (outside of decanters and pourers/aerators) by putting it in contact with something, or subjecting it to heat, cold and voodoo dolls – those products are a waste of money. In general, if you don’t want something for yourself, don’t give it as a present – that simple. I honestly think I exhausted my list. Yes, there are many more wine accessories which I didn’t cover here ( open any wine accessories catalog) – but I hope that I gave you some of the ideas which might help you in your wine gift shopping, where it is not that difficult to get lost. Wine Gifts. I see a smirk on your face – come on, there are millions of advice shared already, by millions of people – aren’t we had enough? Yes, I hear you – but before you click away, give me a few seconds to explain myself. I generally resist the urge to write holiday wine recommendations and wine-related gift guides, primarily for the reason that I’m sure the plentiful advice is available, coming from all possible sources – wine catalogs, wine writers, bloggers, magazine columns and so on. And I also often think “I already wrote about it – why again?”. To my surprise, it appears that I have never written a Wine Gifts post in this blog. I swear I had it in my head numerous number of times – but apparently, it never made it out of it. So that gives me a justification to write this post, and share my views on the wine gifts. That and an upcoming Off The Vine Radio talk show segment with yours truly, where we will be talking exactly about the subject of wine gifts on Friday, December 19th. Before we get to the details of my view on the wine gifts, let me make a few things clear. First of all, if you just need a random wine present for the person you only have to get the gift for, but don’t care about for real, you can stop reading this post right now – I’m sharing my personal viewpoint on the gifts for the wine lovers you actually care about. Now, with that disclaimer in mind, did you notice the words which appear in the title – “pragmatic” and “practical”? I really mean it, so again, please allow me to explain. Let’s start with “pragmatic“, and let me give you an example. I don’t know how many of you aware of Laguiole steak knives, but they are beautifully designed and perfect for the job of both enhancing the aesthetic pleasure of dinner and actually cutting the meat. If you buy them from the catalog, you will pay in the US roughly $200 for the set of 6. If you go to the Home Goods store in the US, you can find (yes, you have to look for them, they are not always available) the same knives for under $20. Did you get my point? No, I’m not asking you to be frugal with your dear friends – if you can afford to present someone with the bottle of Screaming Eagle, by all means, go ahead and do it. But at the very least, you have to know what you are paying for and you should go after the good quality at the price which makes sense to you, not at the price you think you need to pay to feel good about your present. Now, the second word, “practical“, is probably even more important. You will make the best present if you will have an idea of what your gift recipient actually wants, or at the very least, needs. Nobody needs the 15th bottle opener, 56th cork stopper or an Estate Bottle Opener which will force the gift recipient to make a decision – keep a microwave in the kitchen or through it out to install that Estate Opener thingy on that counter. Also, to make the gift practical, measure it up for yourself – would you like to receive it? If you don’t believe that bottle icicle is a good idea, don’t give it to someone only because you don’t have any better ideas. Make it practical, make it useful. Capeesh? Now, let’s talk about wine gifts. Ahh, sorry, one more note – I don’t want to make this post super-long, so instead of trying to sketch it and somehow lump all together, I will split it out into a series of a few posts. Now we are done with all the disclaimers, so let’s get to it. Let’s start with the most obvious – Wine. This is the most obvious, but not a straightforward present. All depends on your budget and the taste of the recipient. 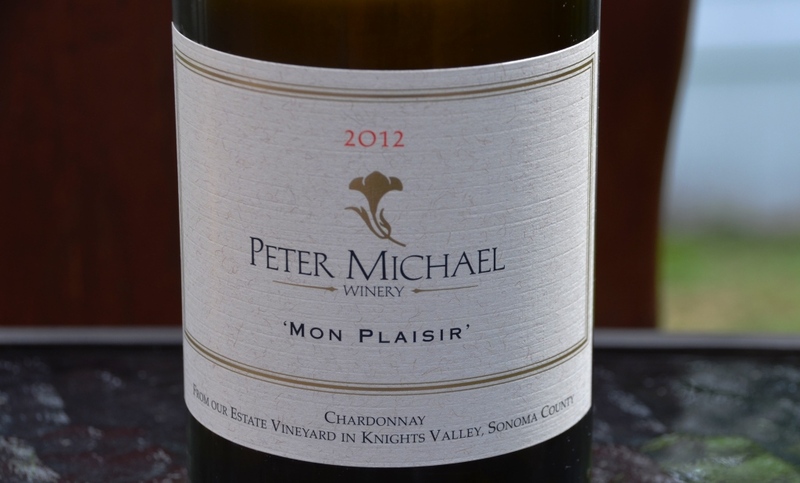 If someone hates Chardonnay, you better know about it in advance. If someone is dreaming about that special Burgundy bottle, you better know about it. Knowledge is power, as you will be able to make the best gift. Wine is actually one of the few presents where you don’t need to worry if the person already has the same bottle – two bottles of Chateau Lafite are always better than one. But even if you don’t know exactly what the other person want, don’t despair – there are a few strategies you can use. Let’s look at your choices again. Wine, when you know what the other person wants. The easiest case, as we said. 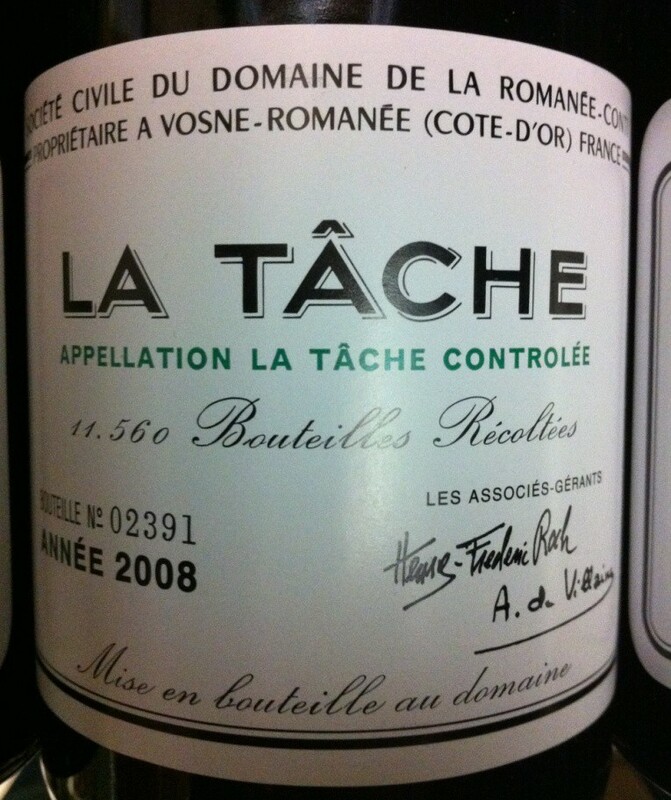 If current vintage of the wine is readily available, go to the store and buy it. If the vintage is not current or the wine is not available, start from the wine-searcher – it will help you to locate your wine at one of the online retailers. 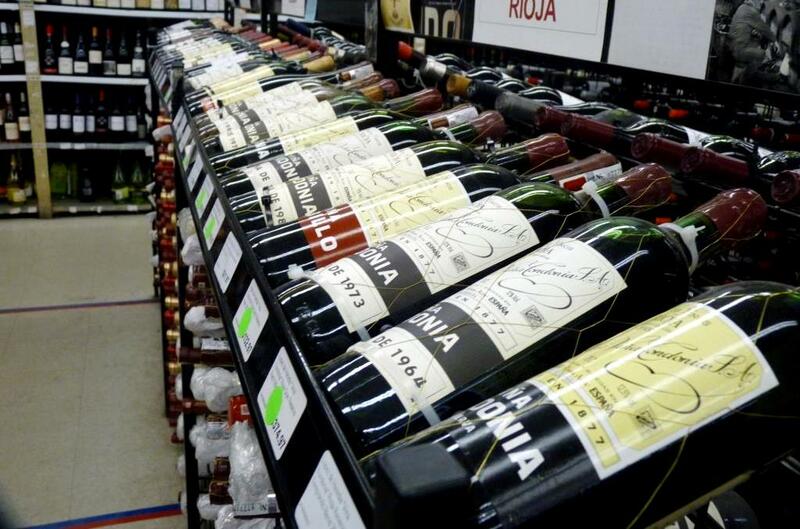 If you are looking for the collectible or an old wine, your best bet is a reputable retailer. I wouldn’t buy it on eBay, but rather look online at the store like Benchmark Wine Company (you can find all the relevant links on my site in the section “buying wine”. Or ask the person at your local store – you never know what you can find in your local store – remember that not all the wines are put out on the shelf. Don’t be afraid to ask. When you don’t know the exact wine the other person wants. Now, if you know general preferences, do your research online or go to your local store. Don’t be afraid to surprise the person. If someone likes Cabernet Sauvignon wines, you don’t have to buy only California or only Bordeaux. Look for the other regions and countries – Argentina, Australia, Chile, South Africa, sometimes Italy and even Spain can be a source of wonderful Cabernet Sauvignon wines. However, if you don’t want to take the risk of gifting the wrong bottle, there are still more options. Buy a mixed set. Within your budget, get a few different bottles. Get creative – go for the different regions, do a mixed case of white and red, buy a few different wines from the same producer. With the mixed set, first of all, I’m sure the recipient will greatly appreciate the thought, and there is a good chance that the person will like at least some of the wines. But – beware of the pre-packaged wine gift sets. If you know the wines in the set – go for it. If you just see a random set in the store, don’t get it without the recommendation of the store clerk you know and trust. Very often, wineries would package together wines which sell well and the wines which don’t sell at all. Get a gift set from the winery. Have your favorite winery? Check if they are offering the gift sets with the direct delivery to the recipient – I know that a lot of wineries in California, and I’m sure other states, are offering beautifully packaged special wine sets. It might be a touch expensive, but if you are willing to pay, this might be a present which will be remembered for a long time. Give a gift of the Wine Clubs. If you don’t know what the other person wants, give a gift of the wine club! Many wine clubs, like an International Wine of the Month Club, will allow you to get a fixed duration subscription – not sure about 1 month, but you can do a three-month subscription. There are of course many other choices – again, do the research online. But – I don’t recommend the newspaper clubs, like Wall Street Journal, New York Times and so on – their wine selection generally sub-par. Don’t forget that many wineries are offering their club subscriptions, and so do many wine stores and online retailers. The Wine Store Gift Certificate. This sounds like a last resort, but it might be an excellent choice too! Unless you are strictly against giving money as a gift for the holidays, a gift certificate will allow the recipient to enjoy your gift twice – first time when receiving it, and then the second time when using it to buy the wines of her choice. A few weeks ago, Jeff, a.k.a. the drunken cyclist, came up with the idea – how about making whole bunch of people happy and excited, just in time for the holidays, by exchanging a few bottles of wine – in secret. As the typical “secret Santa” game goes, we (all participants) have to send one or two bottles of wine to someone – of course nobody has any idea who is sending wine to whom, as all the recipients are set at random. We also were asked to include a little note about ourselves and how did we chose what wine to send – for all detailed rules and regulations you can look here. I really liked the idea from the very beginning – being able to share the wine with someone and an anticipation of the surprise of the wine someone have chosen for you was definitely exciting. As the idea was discussed further, both in Jeff’s blog and in the e-mail, the main problem surfaced. Legally, you have to have a liquor license in US in order to send wine to someone. The creative ideas were exchanged – ask winery or a store to ship the wine you selected to your recipient; print the label at home and drop the box at UPS or FedEx – they will not ask the questions; ship the wine via US mail – but don’t tell them you have anything liquid inside (this is what I did). With this main problem out of the way, the next key question was: what to send? Choosing the wine for such a secret mission is very far from simple (sorry, laugh all you want – we, wine snobs, like to complicate things). You want the wine to match the preferences of your recipient. 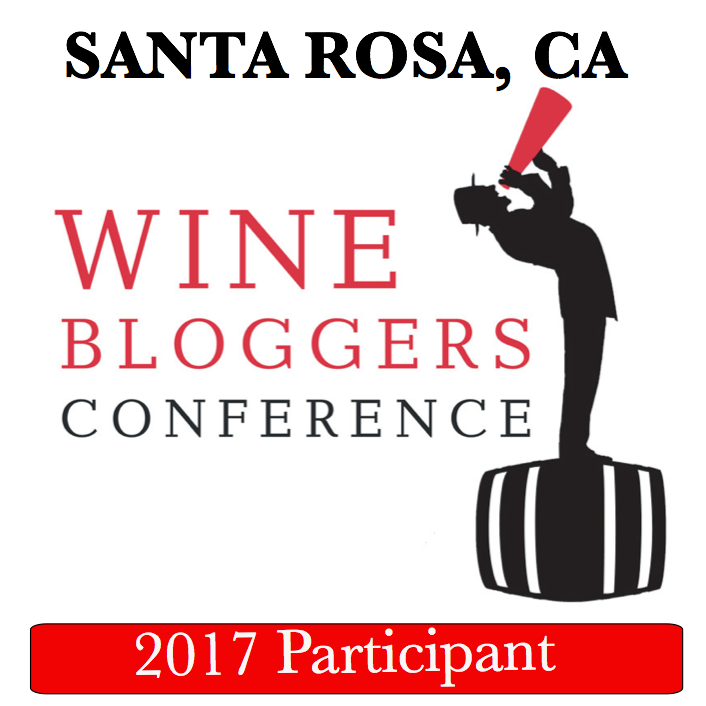 Okay, so may be I’m complicating things for no reason – most of the participants should have a blog, and in that blog they probably talk about wine, so it should be not that difficult, right? Hmm, let’s see. Finally I got the e-mail – my recipient was Chef Mimi. I went to Chef Mimi blog, which boasts beautiful pictures of food (I’m a sucker for the beautiful food pictures) and tons of recipes. I read the About section, I searched for the word “wine” in the Chef Mimi’s blog – and I couldn’t find any clues to what she might like! So I put my thinking cap on (just kidding – no cap – I just stare blindly into the computer screen). I went through Chem Mimi’s blog posts, thinking – what would I pair with this or that dish? Finally – yes, I got it – Riesling would be one, because it would perfectly pair with these sliders, and, and, and … a Merlot, middle-of-the-road-and-often-great red wine? I have a few bottles of this great Riesling, of course with the name only Oliver can pronounce, 2007 Eitelsbacher Karthauserhofberg Riesling Kabinett Mosel-Saar-Ruwer (I talked about Spatlese from the same producer in this post, but I chose to send a Kabinett). And for the Merlot – as I live close to Long Island, and I recently was on the trip there and immensely enjoyed 2005 Estate Merlot from Jamesport, this was kind of a no-brainer decision for the wine which is unique and different. Done and done. The rest is history – you can read about it in the Chef Mimi’s post. A few days after, my wines arrived. Inside the box, there was a handwritten note from @NewfD90, explaining the preference for the Italian wines hence the selection sent to me – Sangiovese from California and Primitivo from Salento “just for fun”, as the note said. I decided to start with 2010 Menhir Salento Quota 31 Primitivo Salento IGT (14% ABV). I have a limited experience with Primitivo wines. While Primitivo is a close relative of Zinfandel, and Zinfandel makes some of my most favorite wines, the Primitivo wines I taste in the past were nothing close to the Zinfandel, and shall we say it, not that great. So you can imagine that my expectations were not that high. Open the bottle, pour, sniff, swirl, sip – wow, this is great! I have to honestly say that this was the best Primitivo I ever tasted – and outside of the Primitivo category, this was simply an excellent wine. Ripe raspberries profile on the nose, dark dense fruit on the palate, with more raspberries and blackberries, good round tannins, overall very balanced. Medium to long finish. A very pleasant wine overall. 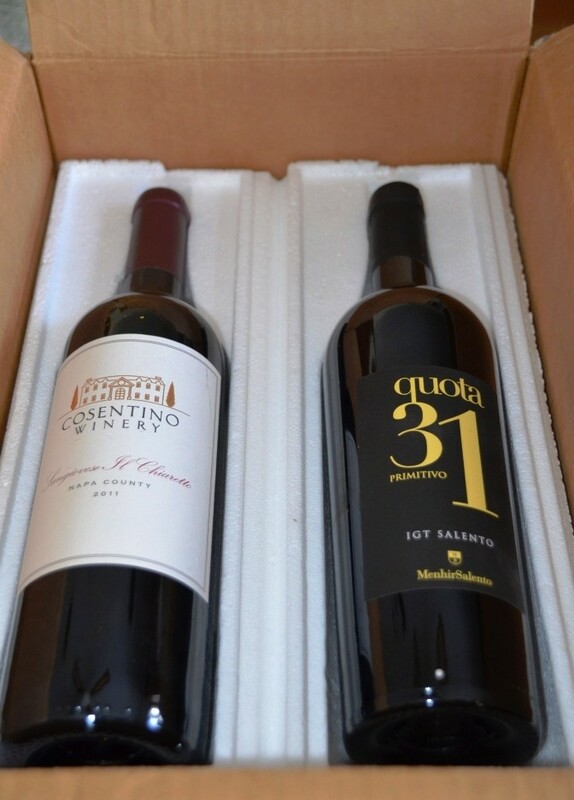 Cosentino is the well known producer from Napa Valley in California, making a wide range of wines from Chardonnay to Cabernet Sauvignon to Zinfandel. This was my first experience with Cosentino Sangiovese. This 2011 Cosentino Sangiovese Il Chiaretto Napa County (15.5% ABV) opened up nicely with the nose of leather and smoke, generally resembling Pinot Noir a lot more than any Sangiovese wines I tasted in the past. On the palate it showed touch of tobacco and licorice, with a bit too much of a sweet fruit and then black pepper in the back. It also showed some noticeable tannins. What this wine was lacking was balance and harmony – all the components stuck out on their own. I decanted some amount of the wine, but 3 hours in decanter didn’t help it. 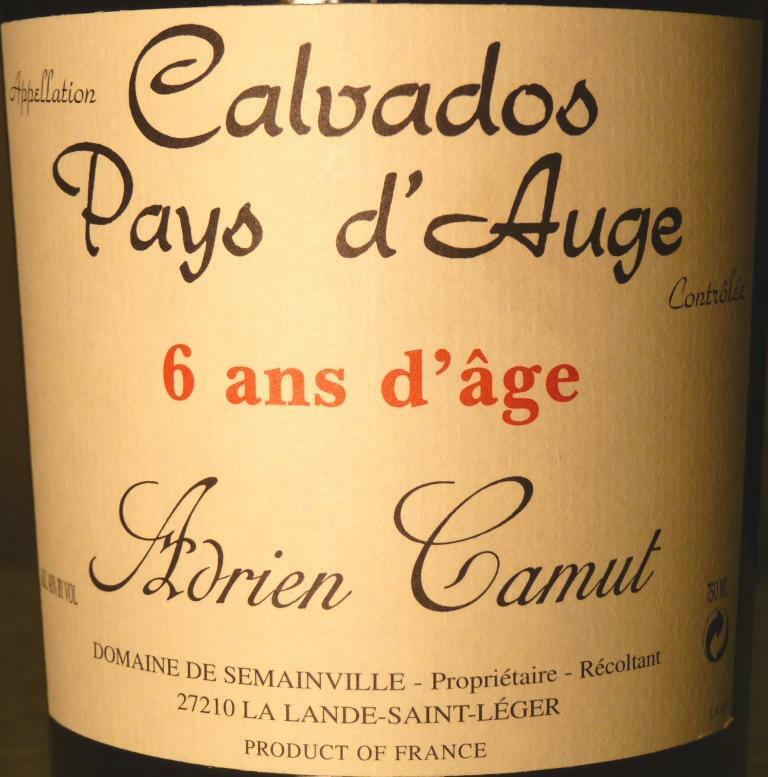 I really tried to fall in love with this wine, by tasting it little by little over the next four days – to no avail. While the wine was changing day to day, and it was still drinkable on the day 4, it didn’t come to greatness. I had much better Sangiovese wines from Temecula valley, where the grape quite popular, so may be Napa Valley is just not the place for this grape to shine. But – tasting new wines is always a fun challenge, so I”m glad I had this experience. That concludes the Secret Wine Santa report. This was definitely fun, so I would like to thank Jeff for coming up with the idea and I’m already looking forward to the next year’s Secret Wine Santa project. Hmmm, that’s a long wait, isn’t it? May be we need to extend the idea to the Secret Wine Admirer? That would be awesome! Cheers! As a self-appointed chronicler of WTSO (Wine Til Sold Out) deals, I want to bring to your attention the details of not one, but two of the events WTSO conducted in December. The first event was done as part of the CyberMonday on December 2nd – it was a Gift Marathon. The event was different from the typical WTSO Marathon – all the wines were offered as gift sets consisting of one bottle of wine and two Riedel varietally correct glasses. There were no minimums, and you could specify multiple shipping addresses, which greatly simplifies wine gift giving. New sets were offered 36 times, from 8 AM Eastern until midnight – there was a lesser number of wines offered, as some of the gift sets were repeated. I was not able, unfortunately, capture all the prices – from the few that I did, I can say that some of the gift sets were great deals, like Sassicaia at $149 – this is much better than the regular price of that wine alone, forget the gift set packaging. Overall, there were quite a few great deals offered. The second event was Magnum Marathon on Thursday, December 12th, from 8 AM Eastern until the midnight. There were 57 offers, with most of the wines coming as 1.5 liter bottles (magnum), and few of the 3 liter bottles (double magnums). Prices per bottle ranged from $24.99 to $499, and the minimum quantities (to get free shipping) were from 1 to 3. What was interesting is that for the first time that I remember, both marathons featured a 100-point wines. And both events were “no holds barred” type, with some of the best known names being present, such as Cristal, Heitz, Caymus, Joseph Phelps and others. Without further ado, I will leave you on with the data. Yes, my collection was somewhat lacking this time, so you will see some missing data as to pricing and source of ratings – oh well, I hope you will still find it interesting. 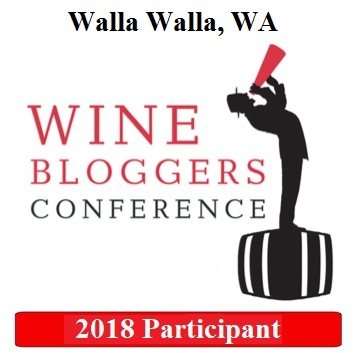 As usual, before I will leave you with the data, here is the guide to the rating abbreviations: WS – Wine Spectator, WA – Wine Advocate, ST – Steven Tanzer, WE – Wine Enthusiast, WRO – Wine Review Online, W&S – Wine and Spirits, JS – James Suckling, RP – Robert Parker, JHN – Jonathan H. Newman, D – Decanter Magazine, rating goes in stars ( 5 stars is max), JH – James Halliday, TRR – The Rhone Report, BH – Burghound, IWR – International Wine Report, TLC – The Library Collection, PR – Pinot Report. 12:00a Our 2013 Magnum Marathon is officially over (sad) but what an awesome day! Hoping all of you had a chance to score some “BIG” wine deals! That’s all I have for you for today, folks. Did you get anything during either one of the marathons? What do you think of the deals? It is this time of year again – the time when we strive to bring little happiness to those who make our lives complete. Often we endure some frustration in the quest to find that “just the right thing” which will make our friends and families to say “thank you” as they actually mean it. Last year I published an extensive post about variety of wine gift options available to you – I think this year, it is still every bit as actual, hence I take the liberty of re-posting it here. Hope you will find it useful. Cheers! Holiday Gift Guide For Wine Lovers.